Now this is pretty awesome. Toyark forum member Goldengreg has pointed us to a new Macross Howard GU-11 Gun Pod Replica. This “human-sized” replica of the guns used by the Valkyries from the extremely popular anime series is being produced by Arcadia. The gun measures 84CM long (about 33″). It will include features like light-up, vibration, roll, extend, and numerous sound effects. there will be two versions, a standard and and EX version. The EX version will include a leather strap and a “UN SPACY” decal on the side of the gun. Now, these replicas will be extremely limited, with only 50 of each being made. The standard version will sell for 128,000 Yen (about $1263 USD), with the EX version selling for 158,000 Yen (about $1560 USD). 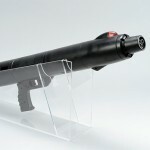 The Macross Howard GU-11 Gun Pod Replicas are due out in May. Pre-orders end on March 31st. You can order the Howard GU-11 Standard Edition or the Howard GU-11 EX Version. You can see photos by reading on. Summer WonderFest 2013 started this past weekend in Japan and Arcadia debuted their 1/60 YF-19! On display was a full color sample with all the missles it’s planned to come with. In addition, the previously revealed VF-1S Roy Focker Special Movie Version was on display. A new release was also shown, the VF-1S Hikaru Ichijo Movie Version, which comes with the new display stand that comes with the aforementioned Roy Focker Special VF-1S. This display stand was revealed to have opening storage compartments. You can store the missles and stand adapters in there! Rounding out the display was the 1/60 VF-1J 30th Anniversary Version, shown with the box designed by Tenjin. Images are from Arcadia’s blog. Read on to check out the images! 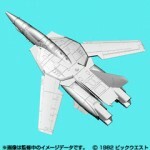 Bandai’s Hobby Division has launched their main site for their upcoming 1/72 VF-1 Perfect Transformation Model. It will serve as an ongoing development blog. We don’t normally cover Macross plamo here, but the primary thing that stuck out was the perfect transformation(no parts removal needed for transformation) aspect. Uchida(who worked on the Macross F 1/72 tranformable VF-25 plamo), kicked things off with the 1st post. After development of the 1/72 VF-25 plamo in VF-25, Uchida desired to make a VF-1 Valkyrie model using current technology. Editors note: Bandai is not a stranger to VF-1 plamo as they did make the VF-1 Hi-Complete Model in 1/72 scale during the mid 80’s, in addition to reissuing Imai kits in various scales since. Bandai Hobby decided to commemorate the 30th anniversary of Macross with the 1/72 VF-1 Perfect Transformation Model. One goal is to design a transformation that does not compromise proportions in any mode. Another goal is to emphasize gimmicks in battroid mode and leg articulation, going beyond using just the joints required for transformation. The model is still a work in progress so Bandai Hobby is considering many ideas to implement on it. Recently, Uchida met with Macross creator Kawamori Shoji and showed him the 1st CG image of the model. 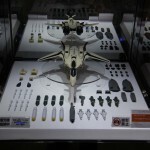 Kawamori is supervising this project, and Bandai Hobby has also received feedback from the editor of Hobby Japan, Dengeki Hobby, Model Graphix and fans(like at the All Japan Hobby Show earlier this month). 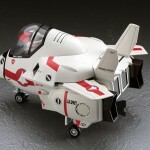 Lastly, Bandai Hobby is aiming to meet the expectations of everyone with this model. Bandai Hobby has never made a Master Grade(MG)-like VF-1 model before, so it will be interesting to see how this turns out. It seems like it will be an evolution of the technology used on the 1/72 VF-25 plamo. 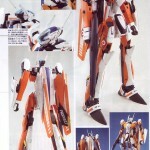 Or perhaps, it may turn out to be Bandai’s modernized interpretation of their old Hi-Complete Model VF-1? Stay tuned. Click on the title bar to see more! 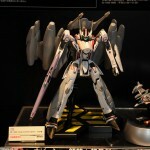 VF-1A Hikaru Custom from DYRL? VF-1A Max Custom from DYRL? Package art is by none other than Hidetaka Tenjin! Click on the title bar to see more! 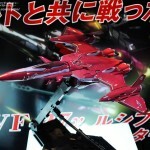 Bandai released new images of their upcoming 1/72 VF-27 Lucifer model kit from Macross Frontier. You’ve seen the VF-27 Lucifer do some damage in the TV series and undoubtedly you’ll see it do more in the upcoming movie! Based on the YF-24 prototype, like the VF-25 Messiah, but exponentially more powerful than the latter, this devilish variable fighter features advanced technology and weaponry. The model is the most accurate rendition of the VF-27 announced so far. Click on the title bar to see more! The All Japan Plamodel Hobby Show has unveiled several new items for the 1st time, including the 1st color model by Bandai of the 1/72 VF-27 Lucifer from Macross Frontier! Previously we’ve only seen CAD images and the resin prototype in gray. Flown by the antagonist Brera Sterne, the VF-27 was superior to the VF-25 in many ways, proving particularly destructive during it’s initial brief appearances. Pam’sHomePage, Amiblo and GA Graphic were able to get up close and take pics of the completed model. Click on the title bar to check them out! Discuss on the Toyark Forums› Views: 7697 › Credit: Razerwire of the Toyark Forums! Bandai has just revealed the newest armored variant of their 1/72 VF-25F Messiah model from the upcoming Macross Frontier movie! With a design evoking the VF-2SS Valkyrie II with SAP, VF-0D Phoenix, and VF-1S Strike Valkyrie, this new variant features upgraded weaponry and armor that differs from both the Super Messiah and Armored Messiah configurations shown in the Macross F TV series. Click on the title bar to see more images from Pam’sHomePage, GA Graphic and Amiblo who were both at attendance in the All Japan Plamodel Hobby Show! Discuss on the Toyark Forums› Views: 4971 › Credit: Razerwire of the Toyark Forums! Bandai has released updated images of their 1/72 scale VF-27 Lucifer model kit from Macross Frontier showing more detail than before! The VF-27 made it’s debut as a mysterious Valkyrie with immense power and speed; sneaking in and out of battle. 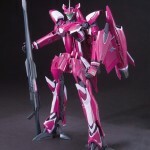 The purple version shown was piloted by Brera Sterne, who had a mysterious connection to Ranka Lee…. Taking cues from the VF-14, this variable fighter has flight controls and systems significantly different from the VF-25 Messiah. Click on the title bar to see the latest images of the prototype! 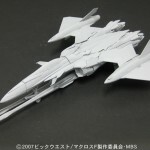 The latest issue of Dengeki Hobby has shown new images of the Macross Frontier 1/72 scale, YF-25 PROPHECY model kit. This is the prototype version of the VF-25 Messiah, and these scans are the first images of the completed kit painted with markings applied. The markings take influence from the YF-16 Fighting Falcon, and VF-1S Skull 1. Also shown are fixed pose figures of Ranka Lee, Klan Klan, and Sheryl Nome, the popular females of Macross F! The Klan Klan and Ranka Lee deco VF-25F and VF-25G, as well as the 1st CAD drawings for the VF-27 Lucifer are also shown! Click on the title bar to check them all out!